Basal cell carcinomas (BCCs) are the most common cutaneous tumors accounting for 70% of skin malignancies. Approximately 80% of BCCs occur on the face. Wide local excision is the standard management, followed by reconstruction with flap or split-thickness skin graft (SSG). Oncological surgery focuses on clearance, whereas reconstruction has to focus on form, function, and patient satisfaction, which is valued less and has a negative impact on the patients’ daily life. We analyzed BCC defects of the head and neck region, reconstructed using local flaps and SSG, with respect to clearance, form, function, and the fourth dimension patient satisfaction by using a customized Patient Satisfaction Questionnaire (PSQ), derived from PSQ III. Each question was scored as shown in [Table 2] and the scores were added. Total score equal or above 40 was considered good overall satisfaction. Scores were also analyzed with respect to six aspects of patient satisfaction. All patients recovered well. No systemic complications were observed. None reported any functional deficit. All flaps and grafts survived. All donor wounds healed well without any complications. All margins were free from tumor pathologically in all cases. 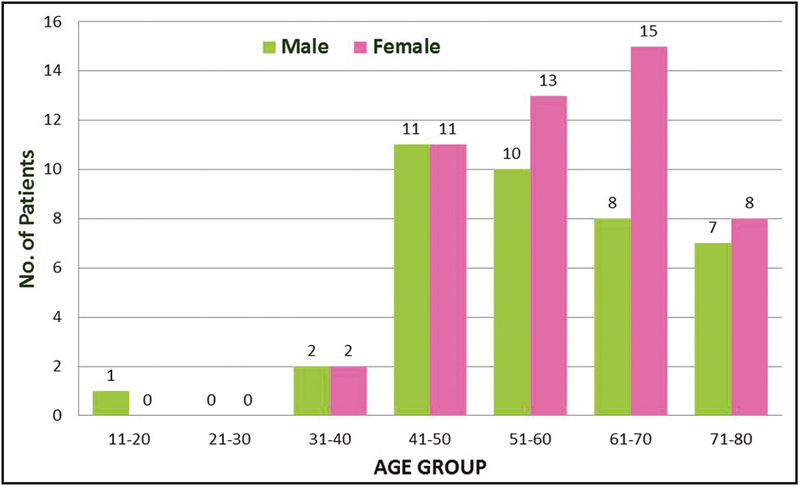 Incidence was more common in female population (55.7%) [Figure 1]. Majority of patients (52.3%) were in their sixth and seventh decades. The youngest in our series was of 15 years and the oldest was of 79 years. A total of 35.2% cases were present in the cheek and 27.3% in the nose [Figure 2]. Approximately 19.3% of defects involved multiple aesthetic subunits. Clinically, 84% cases were nodular, 10.5% ulcerative, 4.5% superficial spreading, and 1% basosquamous. 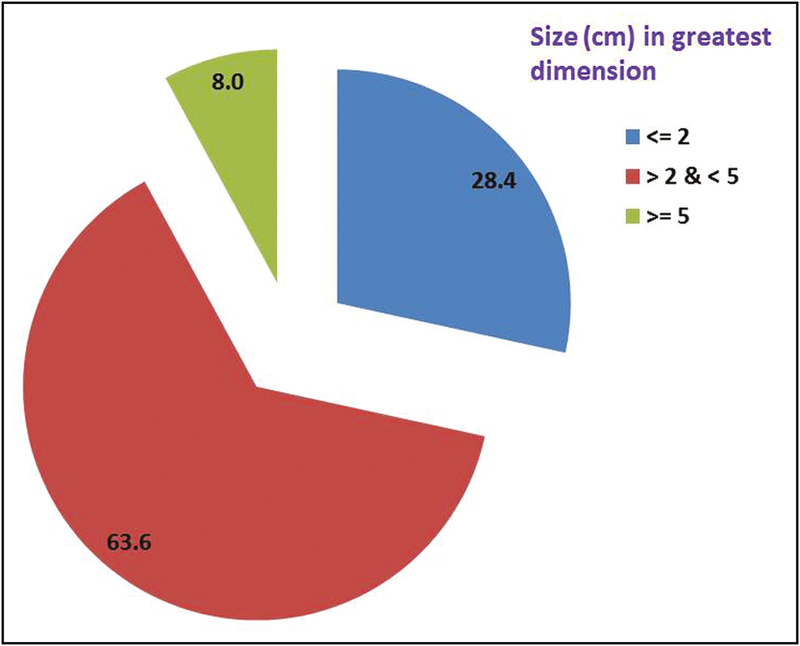 Approximately 28.4% of patients presented with lesions equal to or less than 2cm in greatest dimension [Figure 3] and underwent excision biopsy based on clinical diagnosis. In 71.6% patients, lesion was more than 2cm and preoperative biopsy was performed to confirm the diagnosis. Eight percent presented with giant BCC. Approximately 77.3% defects were reconstructed using local flaps, 18.2% underwent SSG, and 4.5% underwent fusiform excision and primary closure [Figure 4]. 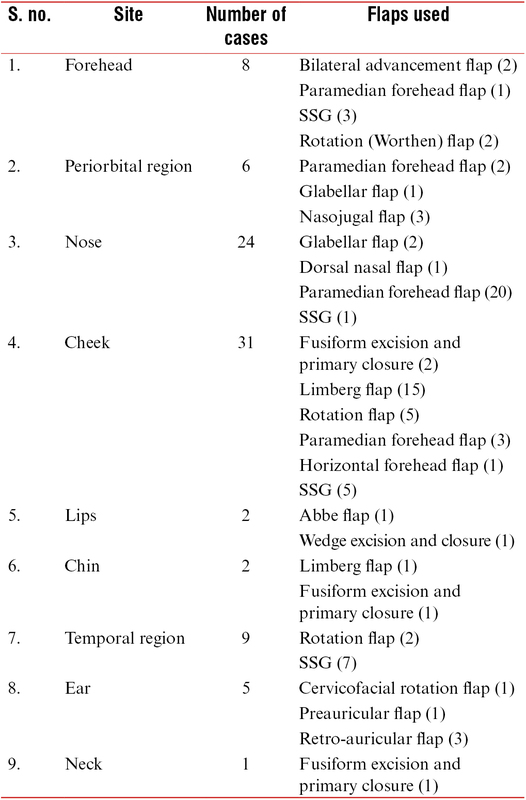 The most common flap for cheek defects was Limberg flap (48.4%) [Table 3]. 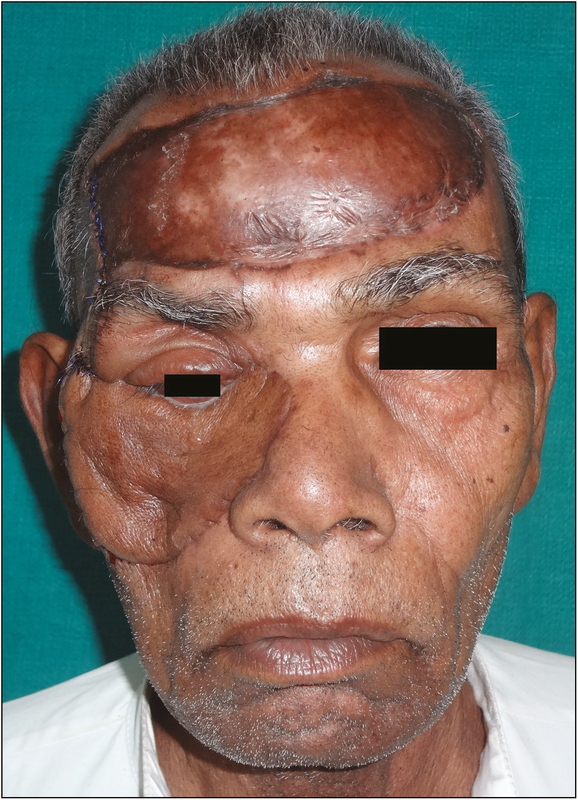 The most common flap for nose defects was paramedian forehead flap (70.8%) [Figure 5]A–D]. In 32.9% (29) cases, reconstruction was a staged procedure. Initial flap inset was given and flap division and final inset were carried out after 3 weeks. Flap division was required in all 29 cases. Flap thinning was carried out in 10 cases. 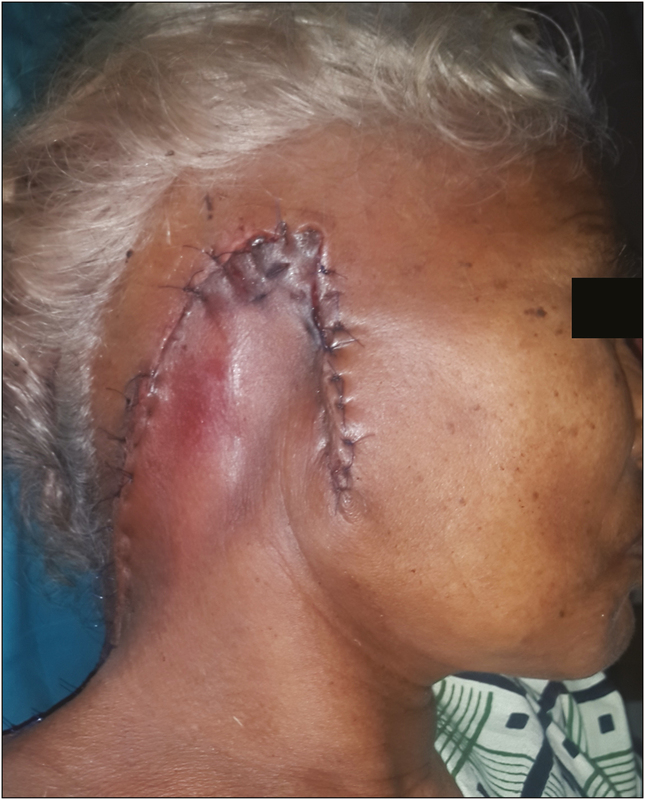 Flap donor site wounds were closed primarily, except in two cases of paramedian forehead flap and one case of horizontal forehead flap, which were covered with SSG. Complications were seen in six cases: two cases with wound dehiscence, two cases with marginal necrosis, one case with partial necrosis, and one case with recurrence [Figure 6]. Both cases of wound dehiscence, seen in rotation flap for cheek, were managed by secondary suturing. Cases of marginal necrosis, one involving the ear and the other involving the nose, were managed conservatively. Partial necrosis was observed in cervicofacial rotation flap for ear and was managed by re-rotation of flap cover [Figure 7]. 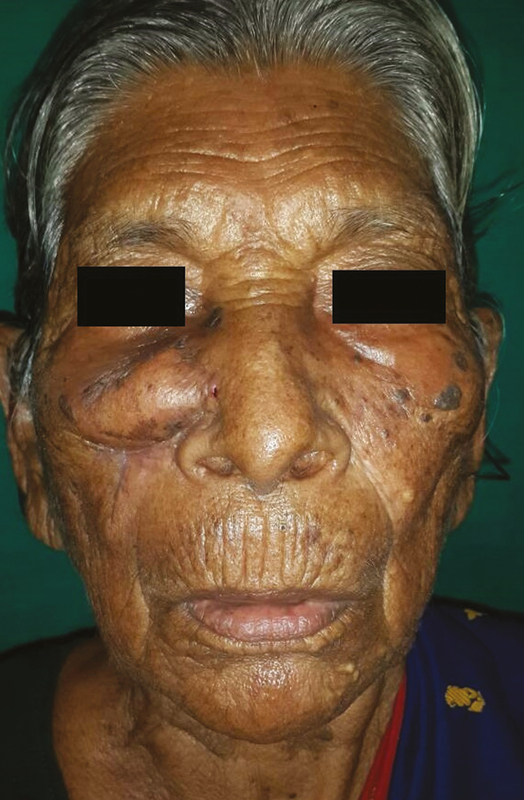 Recurrence was observed in a case of BCC of the cheek and nose, reconstructed by paramedian forehead flap after 1 year, which was managed by re-excision with a 5-mm clearance and cheek rotation flap [Figure 8]A–E]. As per the customized PSQ scale and our scoring system, 64 of 88 patients (72.7%) were satisfied with the medical care and reconstruction with a score of 40 and above. Eighteen patients (20.5%) scored between 30 and 39. Thirteen patients had issues with technical quality, three with communication, and two with accessibility and convenience. Six patients (6.8%) scored between 20 and 29, including three cases of flap cover and three cases of SSG. Their primary domain of dissatisfaction was with technical quality. 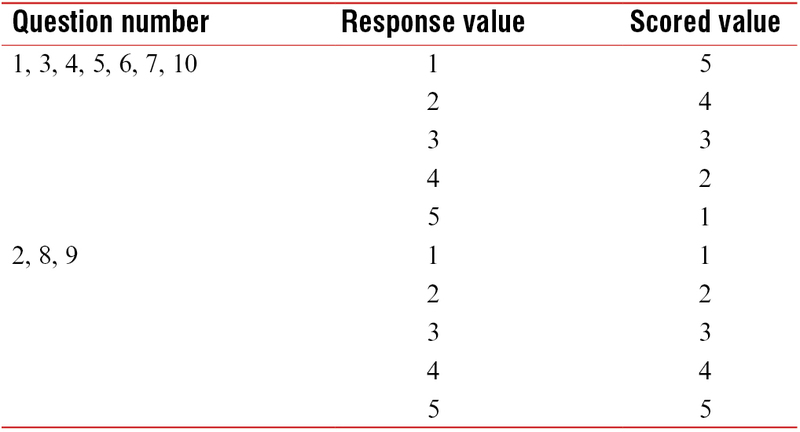 None of the patients scored less than 20 [Table 4]. On the basis of the six main aspects of PSQ III, 24 patients (27.3%) were not satisfied with the medical care. All patients were satisfied with the general aspects of the medical care, interpersonal manner, and time spent with doctor. Nineteen patients (21.6%) were dissatisfied with the technical quality. 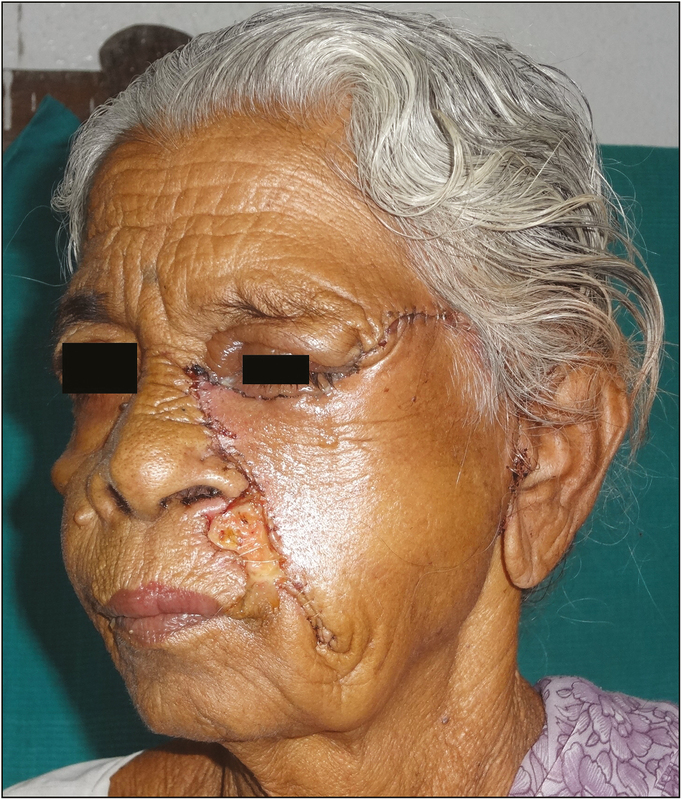 Among them, sixteen patients underwent SSG and three underwent flap reconstruction. Dissatisfaction was due to color mismatch in SSG, recurrence, pinna excision, and ectropion of lower eyelid. Recurrence was managed by re-excision and flap cover. Ectropion was because of the weight of the flap and was managed by static sling [Figure 9]. The patient with absent pinna secondary to excision was given external ear prosthesis. Color mismatch because of SSG could not be corrected. Among the 24 patients, three (3.4%) were dissatisfied with the communication because of language issues. Two patients (2.3%) were dissatisfied with the accessibility and convenience. Face is the most common site of BCC because of chronic sun exposure. Nose is the most common site of facial BCC, accounting for 25%–30% because of cumulative exposure.,,,,,,,, In our study, cheek was the most common site accounting for 35.2%, whereas nose accounted for 27.3% of facial BCC. BCC is usually observed in older patients who are frequently and chronically exposed to sunlight. Men are more commonly affected due to their outdoor occupation. In few studies, when the whole head and neck region was encountered, no statistically significant difference between men and women was observed.,,, In our study, 55.7% cases were of female patients probably because of dynamic epidemiology of BCC with increasing female preponderance. Giant BCCs are defined as the tumors that are more than or equal to 5cm in its greatest dimension. The most common location of giant BCC is the back. Eight percent of our patients presented with giant BCC of the head and neck. Though various treatment modalities are available for the treatment of BCC, wide local excision is the standard line of management. Although Mohs micrographic surgery (MMS) has been widely used and has been proven to achieve a high percentage of tumor resection with clear margins, it is not immune to controversies when treating truly aggressive tumors., Also, frozen section facility is not available in all centers making MMS practically difficult. After surgical excision, reconstruction is carried out using local flaps, regional flaps, free flaps, or skin grafts. Reconstruction of facial BCC is challenging because equal importance has to be given to clearance, form, function, and patient satisfaction. Local flaps have the advantage of skin color and texture match and are more aesthetically acceptable with minimum donor-site morbidity. In our study, 77.3% defects were reconstructed using local flaps. The choice of reconstructive procedure depends on several factors, including size, location, and involvement of deeper structures [Figure 10] and [Figure 11]., Flaps were chosen for better color and texture match. 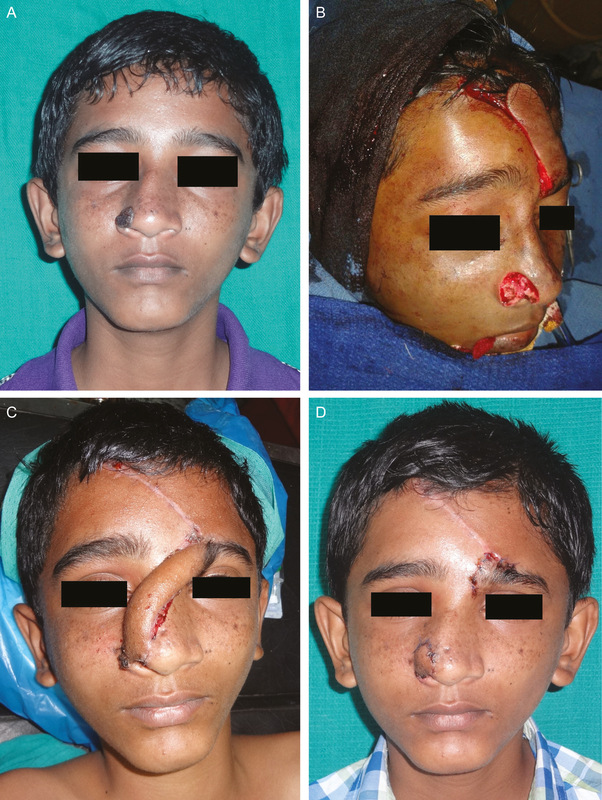 In our study, most commonly used flap for cheek defects was Limberg flap, which is of single-stage reconstruction type, and for nose defects paramedian forehead flap was used, which is two or three staged depending on the need for thinning [Figure 12]A–C]. 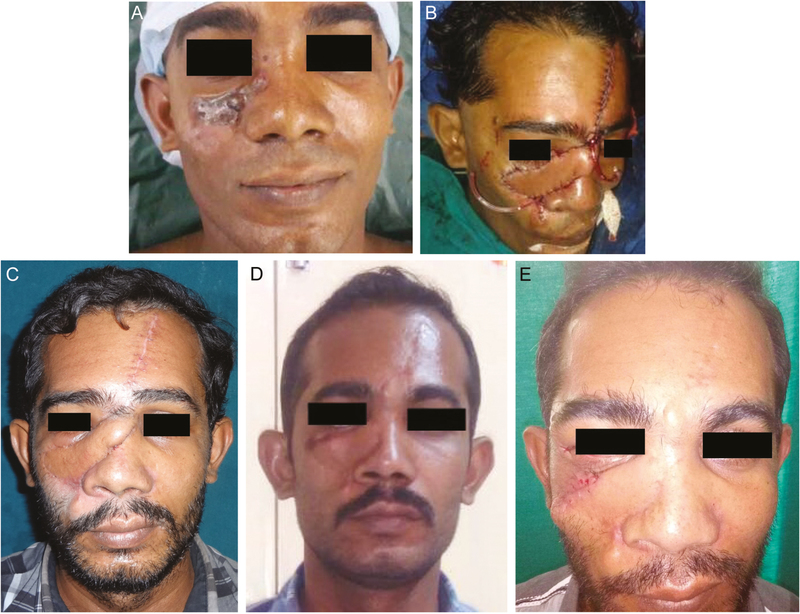 Split-thickness skin grafting is widely used for primary wound coverage after skin cancer resection because donor-site morbidity is lower and larger donor area is available. SSG was carried out for giant BCC when multiple aesthetic subunits were involved and local flaps were insufficient. SSG was performed only in cases in which underlying bone was not exposed. Defects in the temporal region were predominantly reconstructed using SSG because any local flap would bring down the hairline and would be aesthetically unacceptable. Approximately 93.2% of the cases healed well without any complications. Patient satisfaction has been given the least importance in oncological resection surgeries. This is counterproductive in any case of reconstruction of the defects of the face and neck because of the psychological impact the reconstruction has on the patient. An unsightly scar or a formless floppy flap on the face or neck would negatively impact the psyche of the patient and impair normal life [Figure 13] and [Figure 14]. Importance of satisfaction in the health system, especially reconstructive surgery, is more than in other services because of the experience of illness and the need to adhere to and follow long treatment process, increased vulnerability of the patients, and requirement of a more comprehensive psychological support. In our study, equal weightage was given to oncological clearance, form and function, and the fourth dimension, which is satisfaction of the patient in terms of reconstruction. Skin grafting is usually performed when defects are large and unsuitable for primary closure or a local flap. The patients who underwent SSG were dissatisfied with the cosmesis because of poor texture, color, and contour match. Studies have shown that skin grafting was one of the most useful reconstructive modalities for skin and subcutaneous tissue defects; however, postoperative scars were a determining factor of patient satisfaction, in particular, the color match between the grafted skin and the surrounding recipient skin was important. The reconstruction poses a challenge for the surgeon when the lesions are large, the depth of resection exposes bone, and when like or local tissues are paucity. The risk–benefit balance and the choice of reconstruction were explained to all patients. Though initially accepted, on late post-op follow-up, the patients were discontented with the end result. Fulfilling the four dimensions was more possible with local flaps than with SSG. The patients with smaller lesions and those with lesions in the lateral segments of the face were easily satisfied with the reconstruction. In the central segment of face, some patients who were initially unhappy were satisfied after flap thinning. As reconstructive surgeons, our main aim is to provide a method of reconstruction where donor tissue resembles native tissue, contour match is good, suture line scars are less obvious, and complications are nil. This brings about a better patient satisfaction. Post-excisional defects of BCC in the head and neck region have to be reconstructed with equal weightage to all the dimensions of oncological reconstruction: clearance, form, function, and patient satisfaction. Though split-thickness skin grafting is an easier option, it is fraught with unsightly scars on healing. Local flaps have good color and texture match and are sensate, making them ideal for reconstruction of facial defects. Facial animation is also better restored after flap reconstruction. Thus, local flaps are better in satisfying the fourth dimension of reconstruction, which is patient satisfaction. Casson P. Basal cell carcinoma. Clin Plast Surg 1980;11:301-11. Wollina U. Epithelial tumors of the outer nose. Indian J Dermatol 2003;11:194-9. Netscher DT, Spira M. Basal cell carcinoma: an overview of tumor biology and treatment. Plast Reconstr Surg 2004;11:74E-94E. Ge NN, McGuire JF, Dyson S, Chark D. Nonmelanoma skin cancer of the head and neck II: surgical treatment and reconstruction. Am J Otolaryngol 2009;11:181-92. Sartore L, Lancerotto L, Salmaso M, Giatsidis G, Paccagnella O, Alaibac M, et al. Facial basal cell carcinoma: analysis of recurrence and follow-up strategies. Oncol Rep 2011;11:1423-9. Tiftikcioğlu YO, Karaaslan O, Aksoy HM, Aksoy B, Koçer U. Basal cell carcinoma in Turkey. J Dermatol 2006;11:91-5. Farhi D, Dupin N, Palangié A, Carlotti A, Avril MF. Incomplete excision of basal cell carcinoma: rate and associated factors among 362 consecutive cases. Dermatol Surg 2007;11:1207-14. Smith V, Walton S. Treatment of facial basal cell carcinoma: a review. J Skin Cancer 2011;11:380371. Gloster HM Jr., Neal K. Skin cancer in skin of color. J Am Acad Dermatol 2006;11:741-60; quiz 761-4. Soyer HP, Rigel DS, Wurm EMT. Actinic keratosis, basal cell carcinoma and squamous cell carcinoma. In: Bolognia JL, Jorizzo JL, Schaffer JV, editors. Dermatology. Beijing, China: Elsevier Saunders; 2012. pp. 1773-93. Seretis K, Thomaidis V, Karpouzis A, Tamiolakis D, Tsamis I. Epidemiology of surgical treatment of nonmelanoma skin cancer of the head and neck in Greece. Dermatol Surg 2010;11:15-22. Betti R, Inselvini E, Carducci M, Crosti C. Age and site prevalence of histologic subtypes of basal cell carcinomas. Int J Dermatol 1995;11:174-6. Czarnecki D, Collins N, Meehan C, O’Brien T, Leahy S, Nash C. Basal-cell carcinoma in temperate and tropical Australia. Int J Cancer 1992;11:874-5. Demirseren DD, Ceran C, Aksam B, Demirseren ME, Metin A. Basal cell carcinoma of the head and neck region: a retrospective analysis of completely excised 331 cases. J Skin Cancer 2014;11:858636. Harrison LB, Sessions RB, Kies MS. Head and neck cancer: a multidisciplinary approach. 4th ed. Philadelphia, PA: Lippincott Williams & Wilkins; 2014. Sexton M, Jones DB, Maloney ME. Histologic pattern analysis of basal cell carcinoma. Study of a series of 1039 consecutive neoplasms. J Am Acad Dermatol 1990;11:1118-26. Edge S, Byrd DR, Compton CC, Fritz AG, Greene F, Trotti A. AJCC cancer staging manual. 7th ed. New York: Springer; 2010. Archontaki M, Stavrianos SD, Korkolis DP, Arnogiannaki N, Vassiliadis V, Liapakis IE, et al. Giant basal cell carcinoma: clinicopathological analysis of 51 cases and review of the literature. Anticancer Res 2009;11:2655-63. Levy RM, Hanke CW. Mohs micrographic surgery: facts and controversies. Clin Dermatol 2010;11:269-74. Miller PK, Roenigk RK, Brodland DG, Randle HW. Cutaneous micrographic surgery: Mohs procedure. Mayo Clin Proc 1992;11:971-80. Ebrahimi A, Motamedi MH, Koushki ES, Nejadsarvari N. Applications of kite flap in reconstruction of cheek defects after tumour excision. MJMS 2012;11:313-6.
de Oliveira Santos AB, Cernea CR. Surgical management of skin cancers of the head and neck. Open access atlas of otolaryngology head and neck operative surgery. 2017:8-10. Davis AR, Ware JE. Involving customers in quality care assessment. Health Affairs 1988;11:33-48. Marshall GN, Hays RD. The Patient Satisfaction Questionnaire short-form (PSQ-18). Santa Monica, CA: RAND; 1994. Wollina U. Reconstruction of large facial defects after delayed Mohs surgery for skin cancer. Acta Dermatovenerol Croat 2015;11:265-9. Al-Abri R, Al-Balushi A. Patient satisfaction survey as a tool towards quality improvement. Oman Med J 2014;11:3-7. Guru K, Manoor UK, Supe SS. A comprehensive review of head and neck cancer rehabilitation: physical therapy perspectives. Indian J Palliat Care 2012;11:87-97. Kariminasab MH, Azar MS, Ghaffari S, Mohamad S, Daneshpoor M, Nikzad M, et al. Satisfaction in orthopedic patients based on patient satisfaction questionnaire (PSQ). Int J Med Invest 2015;11:214-21. Elnahas W, Hafez MT, Younis RA, Elbassiony L, Hegazy MA. V-Y advancement flap for reconstruction of defects after excision of basal cell carcinoma of the face. Int J Surg Res 2014;11:15-8. Ebrahimi A, Ashayeri M, Rasouli HR. 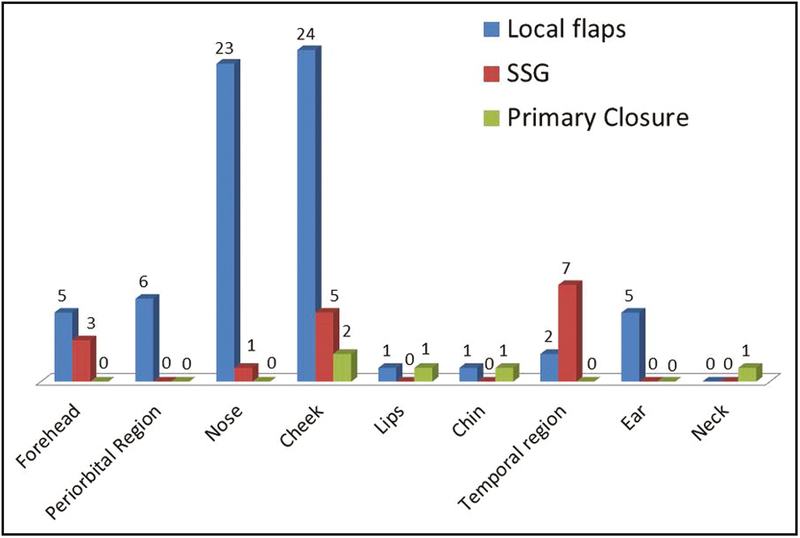 Comparison of local flaps and skin grafts to repair cheek skin defects. J Cutan Aesthet Surg 2015;11:92-6.